Here are the new decorative vent covers we have added to our Arts and Crafts style decorative grilles. RR-209 04×30 $119 This 4″ x 30″ grille is not only a great choice but the only choice for an affordable grille that covers a 4″ x 30″ duct. This is what is available. It is metal which will rust and corrode and the price is the same $119. RR-209 10×30 $199. The Arts and Crafts Style 10″ x 30″ decorative grille covers a duct of the same size. It is available in 14 finishes. The size of this grille allows us to use all the beautiful design elements that were in the original 1817-1940 historic grille. There is nothing in the marketplace that comes even close to appearance of this decorative grille or for that matter any of our grilles. The quality of the carvings has our products in a niche without any competition. Even a very contemporary room style can be complimented by the beauty of this historic piece of excellent craftsmanship and artistry. A competitors 10″ x 30″ grille for $190. There are laser cut decorative grilles that are “cheaper”. I use that word intentionally because they are cheaper looking. We have had customers say that our decorative grilles are like functional works of art. If you were not making this purchase online and saw our decorative grilles next to grilles with laser cut patterns, that woud really be a consideration in making your selection. 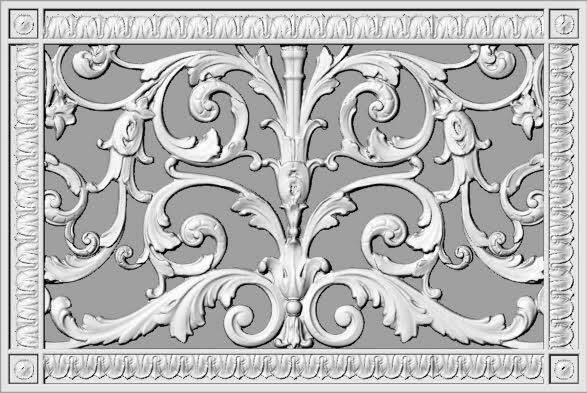 Beaux-Arts Classic Products decorative grilles will last a lifetime. Resin will not deteriorate and the design is timeless. Here are the new Louis XIV Decorative vent covers. RR-203 4×20 $99. The same applies as I stated for the 4″ x 30″ Arts and Crafts decorative grille above. There is nothing like this magnificent Louis XIV style decorative vent cover in the marketplace. Of course this is a perfect choice for a classical decor, particularly one that has architectural details. However, in the right finish this style really works in any decor. It reminds me of a historic classical space that is furnished with contemporary furnishings and it looks great. It works with anything.